Do you know what I've been waiting to see for over a year? (Mirasol, obviously, but besides that.) I've wanted to get my hands on a 7" tablet based on a Pixel Qi screen. And this week I learned that it's finally going to happen. ZTE isn't the only company working on a Pixel Qi tablet now. San Diego based Sol Computer was at CES this past week showing off their 3 new tablets. I've confirmed that some time this spring they plan to launch 7" Windows and Android tablets as well as a 10.1" dual boot Win8/Android tablet. 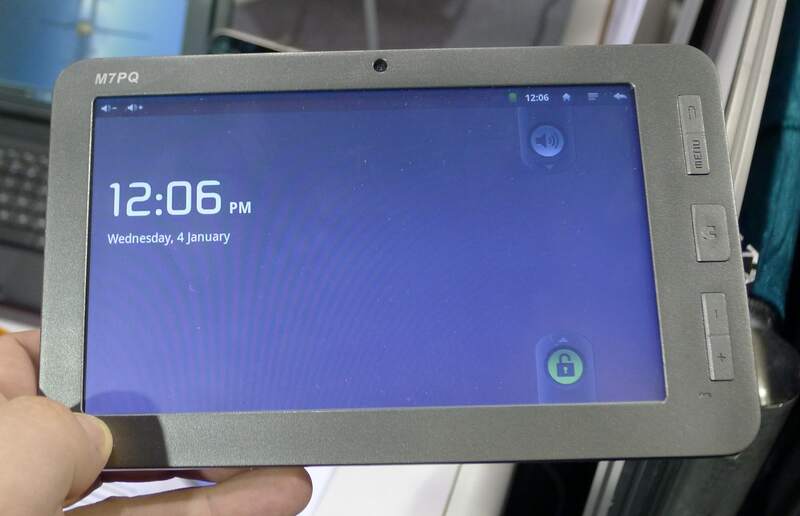 All will have Pixel Qi screens. Specs are still up in the air, but I'm told that the Android tablet will likely be running on a 1GHz Cortex-A8 CPU. So what's the point of a Pixel Qi tablet? Price certainly isn't a factor; Sol Computer's current 10" Win7 tablet is going for $1100 for so-so specs. And the new tablets will probably also be rather expensive. Due to the assembly costs, the tablets will likely retail for $400 or more that their LCD based competition. But like any premium product there are some who need the features. And in this case, the primary customers have been people who absolutely had to use a computer in full sunlight and are willing to pay a premium to get it. BTW, that need to run software is why Sol went with Win7 for their first 2 products instead of Android or another mobile OS. And the premium price means that this is still a niche product. I made a point of not missing this booth because I've been asked a certain question a lot lately. Everyone wants to me to predict which of the new screen tech will succeed in the current struggle to replace LCDs. I would like to say Pixel Qi, but they are still a couple years away from being a mass-market consumer product. My conversation with Chris Swanner, the CEO of Sol Cpmputer, helped me understand why (more on this later). I want want want not a 10″ tablet but a 12″ or even 13″ for reading digital comics. 10″ is just too small for me. And like you I have lusted after a Pixel Qi screen, despite what looks like lower color saturation, since … a long time. But I wonder how the dual-boot will work, given that Microsoft has just announced that ARM-based Win8 machines must be locked down to only Windows and must not be made so they can boot any other OS? Maybe an OEM can do it in advance — and it’s just us users who will be forbidden installing Linux, Android, or BSD? Brad Linder had an interesting video that showed how different types of glass can affect the Pixel Qi screen. So it seems it’s not a straightforward swap-out for current LCDs if the type of glass must be changed to optimize it. Also in his video was a tablet specimen with IR touchscreen (ala Nook Touch, etc). As for SOL, someone wrote that all they’re doing is buying hardware and swapping out the screen with Pixel Qi, which accounts for the premium — cough — pricetag. I’d put more hope in a unicorn 7″ tablet from ZTE. Pixel Qi also looks better to me than color eInkj or Mirasol. I hope it starts to go somewhere. make it waterproof! long live Pixel Qi!